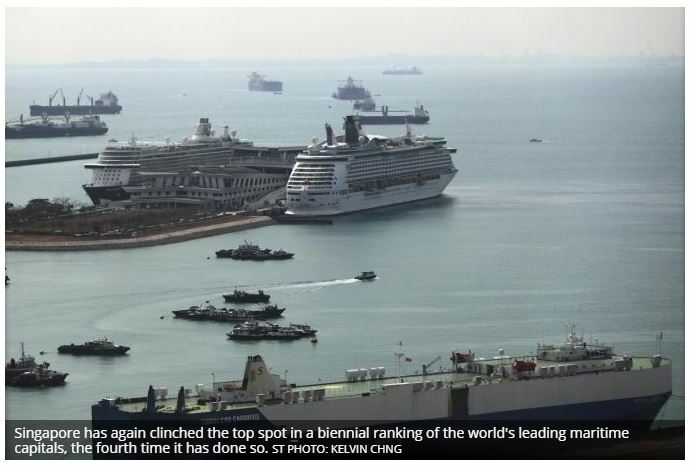 SINGAPORE has again clinched the top spot in a biennial ranking of the world’s leading maritime capitals, the fourth time it has done so. The Republic has consistently topped the Leading Maritime Capitals Of The World report – released once every two years by risk management firm DNV GL and consultancy firm Menon Economics – since 2012 when it was first published. The latest report was released on Wednesday at the Sea Asia conference, held in conjunction with Singapore Maritime Week. Coming in second was Hamburg in Germany, with Rotterdam in the Netherlands placing third. Hong Kong was in fourth place, while London placed fifth. The report assessed 15 maritime capitals based on five areas – shipping, maritime finance and law, maritime technology, ports and logistics, as well as attractiveness and competitiveness. Singapore topped the list in three areas – shipping, ports and logistics, and attractiveness and competition. The report took in the views of 200 maritime experts, who predicted Singapore would retain its top spot over the next five years, though they noted stronger competition from other cities. Also highlighted in the report was Singapore’s ongoing efforts to strengthen its attractiveness as a maritime centre. Maritime and Port Authority of Singapore chief executive Quah Ley Hoon said the recognition was “an affirmation of Singapore’s commitment to develop and grow the maritime industry”. Singapore’s port is one of the world’s busiest, with container throughput hitting 36.6 million 20-foot equivalent units and vessel arrival tonnage hitting 2.79 billion gross tonnes last year.